Road safety is utmost important for all of us, be it the passengers on vehicles, pedestrians or the personnel who is working on the road maintenance and construction projects. Roads are most vulnerable and different countries have striking record of the number of accidents taking place on road. When we talk about road safety we need to understand the vulnerability exposed to workers or people who are on the road construction and maintenance job. The probability of mishaps is not limited to accidents taking place through vehicle crashes but also weather, road floor and heavy equipment and machinery used during the project also impose great risk. The safety shoes supplier India manufacturing gear of protection for feet help to fight this difficulty at working on roads. 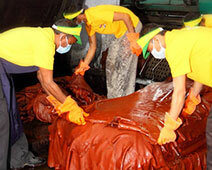 Safety footwear manufactured and supplied them ensure safety of workers in different and difficult working conditions. How Safety Shoes give Protection Gear? • Anti-Skid: The anti-skid and anti-slip quality of these shoes ensures that wearer does not slip or fall during working in difficult and unconstructed roads. 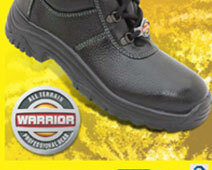 • Tough Sole: The tough sole material of the work shoe ensures that it is not worn and torn in the extreme conditions. • Feather Comfort: These shoes give ultimate comfort like feather with its soft touch and feel and do not impose harshness to the skin. It takes care of your feet and stay tough on difficulties. • Water Proof: These safety footwear have the water proof capability that ensures comfort during rains and other such conditions. • Shock Proof: There are electricity transmitters installed on road and chances of electric shock are there but these safety shoes have shock proof body that gives ultimate protection.